Finally. I have had the pieces to this project finished for over a week and I finally sat down to sew things together. This was a lot of fun. I learned a lot. I could never remember how to cast on stitches (so that was nice to re-learn). The knit stitch I could remember, but I needed a refresher on how to purl. This doll robe was a great project. Small enough to finish in our class (6 sessions). I learned to increase and decrease. I learned how to use the holders (can’t remember if that is the right name for them – those big kilt safety pin looking things. I used markers. I learned how to sew things together (the sleeves in this project). Also, learned a lot about reading a pattern. Overall, I learned A LOT! Ingrid is modeling the bath robe for you, although it looks more like a nice sweater jacket on her – quite stylish I think, but the color is all wrong for her! 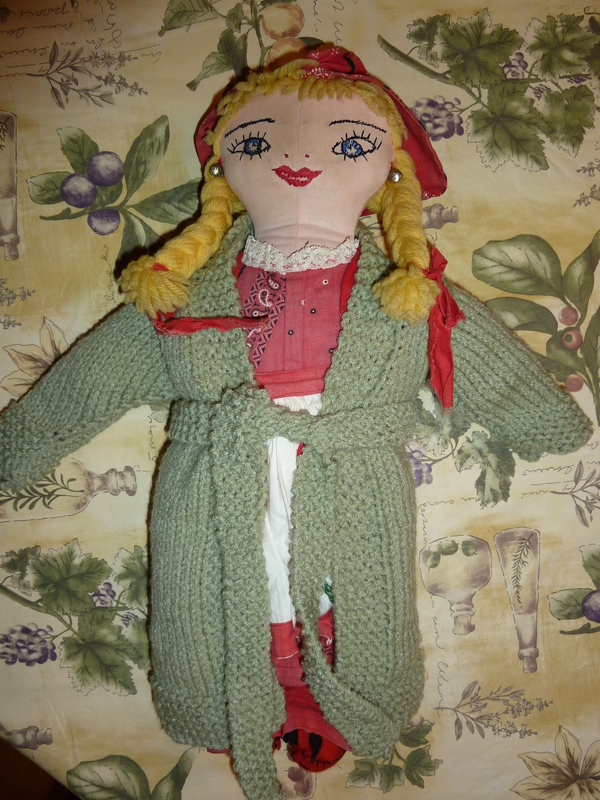 Ingrid is a doll I have had since I was a very little girl (I am going to guess around 5). My mom tells me I came up with her name all on my own. Thanks for helping me Ingrid. On to knitting something else. I need to work on a few more things now to keep the knitting fresh in my head. I have found some patterns for making squares on an afghan and a few others for dishrags that will help me with pattern reading and practicing the different combinations of stitches too. But I must confess that I really want to make socks! I don’t know where that desire comes from, I know I just want to knit them. Gram used to knit socks for use, maybe that is why I want to…I just don’t know. 7 Responses to Kniting project DONE! I have knitted sock before and it was fun. The hardest part for me was completing the second one. By the time I got to it the drive to finish wanes. I found if you knit both socks at the same time it was easier for me. Can’t wait to see what you decide to knit next. When you say “knit both socks at the same time” do you mean have them both going on two different sets of needles? I would think I would knit one and then pick up and knit the second to complete the set straight away. Here is a link to what I mean. It is using the magic loop technique. The link is showing how to do it toe up but you can just as easily do it for cuff down patterns as well. 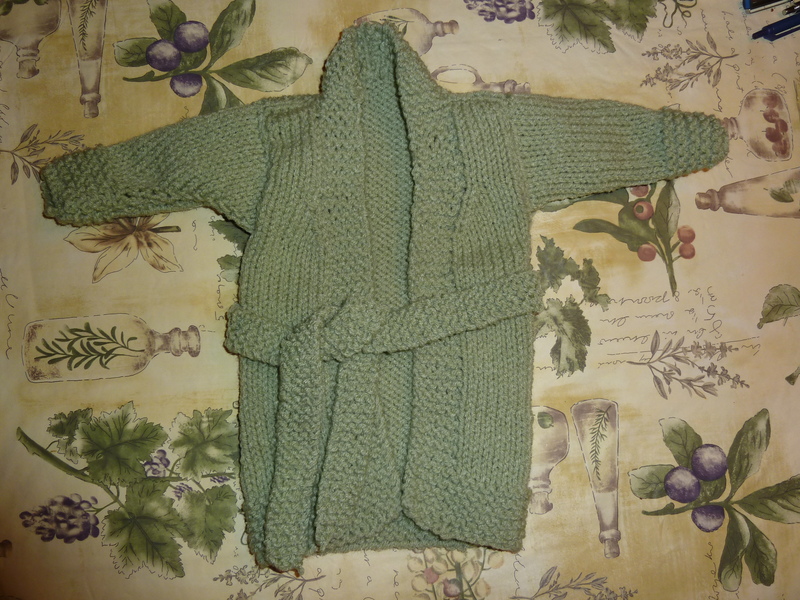 Zonnah – OH MY GOSH – I have never seen anything like it (but I am so new to knitting). What a neat way to knit 2 socks at one time. Thanks.